Raging Tiger implements the capability to add sounds for your vehicles. These sounds will initiate when your vehicle begins moving and fire once, lasting the duration of the sound's length. 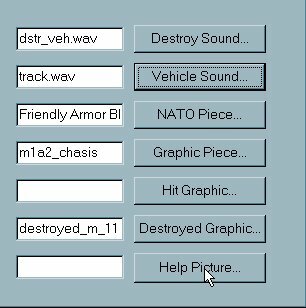 The sound must be in wave (.wav) format and added to your database in the same way weapon and vehicle sounds are currently added. Then it must be linked to the vehicle to which it applies. This topic assumes that you have opened a database or created a new database using the steps described in 'Open a database for editing'. These steps are not specific to Raging Tiger, but apply to Armored Task Force as well. 1. 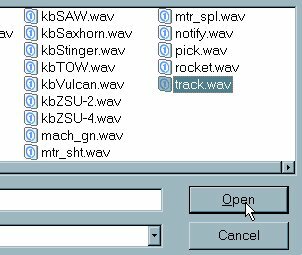 Select 'Add' from the 'Sounds' sub-menu of the 'Database' menu. 2. Select 'Vehicle' and 'OK'. 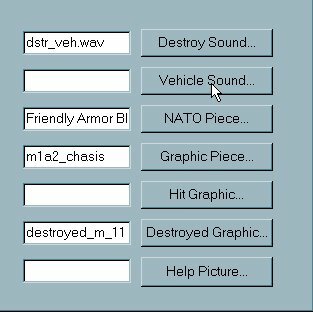 (Weapon sounds can only be selected when editing/adding weapons and Artillery/Mortar sounds can only be selected when adding or editing Indirect Fire Ammo or the Indirect Fire Vehicle Capability). 3. 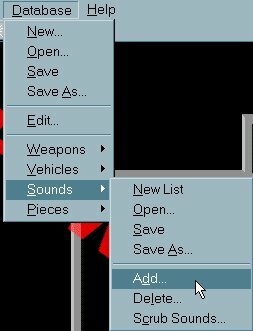 Select the sound you want to add and 'Open'. Now that we have added the Vehicle Sound, we need to tell 'Raging Tiger' which vehicle it applies to. This topic assumes you have added or opened a vehicle for editing, using the steps in 'Create a new vehicle'. 1. 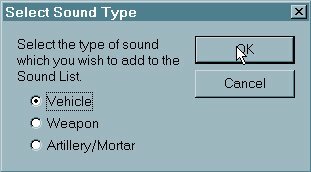 Select 'Vehicle Sound' from the bottom right portion of the Vehicle Edit dialog. 2. Select the sound you added and 'OK'. 3. That's it! The sound will now sound whenever the vehicle moves.